(MoneyWatch) If you spend most of your day racing from one meeting to the next, feverishly answering emails rather than paying attention to the meeting you're actually attending, I've got some good news for you: You're not alone. We all do it. On the other hand, that doesn't make it right. The system is broken, and it can only be fixed from within. The Harvard Business Review recently explained how to break your addiction to meetings, and the article was illuminating. I've railed against unnecessary meetings many times before, and indeed I've even described the cost of useless meetings(spoiler alert: with 73 percent of professionals admitting to doing unrelated work in meetings they're not paying attention to, it's a lot). If the meeting isn't a team priority, decline the invitation. If it's not a personal priority for you, delegate the invite to someone else. If the topic is a priority, but meeting in a conference room isn't the best way to tackle it, decline the meeting and block time on your calendar to solve the problem. Whatever it takes: phone calls, swing by someone's desk... you get the idea. If you're really attending the meeting, spend a little time planning your involvement before you get there. Make sure it's as small, short, and productive as possible. Don't rely on standard 60- or 30-minute meetings just because it's the default in Outlook. Schedule 15 minute meetings when they make sense. Keep the invite list as small as possible. 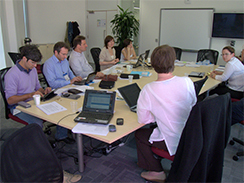 Larger meetings breed ineffectiveness in proportion to the length of the attendee list. Block out time on your calendar to get work done. An open calendar is an invitation to unnecessary meetings. Don't schedule meetings that are informational only - use email for that. Make sure someone is designated in every meeting to take notes and assign action items.